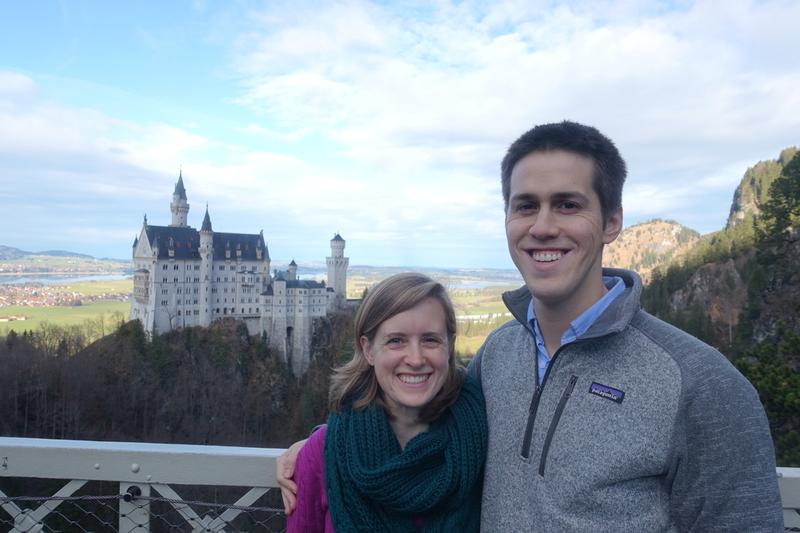 Like so many Americans, we get excited about a good castle. Sure, there's some in the U.S., but they're pretty different than what you can find in Europe, and they just don't feel like the real deal to me. When we visited Munich, a day trip to arguably the world's most famous castle was a priority for me - after all, it's not all that tricky to reach, and we'd certainly be in good company: 1.4 million people visit a year, so we pretty much just had to follow the crowds. Compared to much of Europe, Neuschwanstein Castle isn't all that old - construction began in 1868 and the fortress was ready to be lived in only five years later. The mastermind of this grand project died before final work could be completed though - King Ludwig II of Bavaria died in 1886. Only eleven weeks later, the castle Ludwig envisioned as a private retreat and place to withdraw from public life was opened to visitors, and since then, 61 million people from around the world have come to see his palace. Now, it's one of the world's most recognizable castles and, famously, the inspiration for Disneyland's Sleeping Beauty Castle. D - Disney is also said to have drawn inspiration from the Alcázar of Segovia, which we've also paid a visit to. Maybe this is a sign...perhaps we should go to Disneyland next? A few nitty-gritty details before we get on to more of our actual visit: by car, Neuschwanstein is just under a two-hour drive from Munich, and by train, it's slightly longer. We opted to take the train, using the Bayern ticket as we did the day before to reach Dachau (see more here, as well as info on the Bayern ticket at the end of that post). 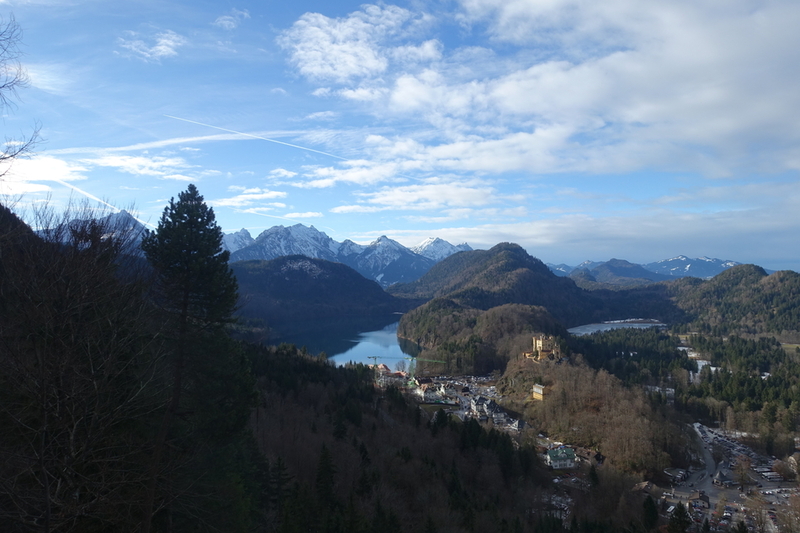 We arrived in Füssen, the small town where the train from Munich drops off passengers, around noon, and then took a 20-minute bus ride up to Hohenschwangau. The ticket office for Neuschwanstein is located in Hohenschwangau, and the castle is just up the hill, accessible via a 15-20 minute walk or short bus or carriage ride (weather permitting). When we reached the ticket office, the earliest available tickets for guided tours of the interior of the castle were for 3pm (plus an hour or so long wait in line to get said tickets), and after a bit of debate, we opted out of the tour and continued on with our visit. It's highly advised that you purchase your Neuschwanstein tickets ahead of time and I tried to as soon as we knew our travel plans, but they were sold out by the time I looked - I think it was about 4-6 weeks in advance. We were disappointed about not touring the castle since we'd heard from one set of friends that this is one castle "you shouldn't miss out on" the interior of, but it was our choice to skip out on the tickets, so we didn't dwell on it. Plus, the main reason we traveled so far to see the castle was really the amazing views of the exterior, not the interior. The buses from Hohenschwangau up to the castle weren't running due to 'weather,' which felt strange since there was hardly any snow on the ground, and definitely none on the roads - we even shed our jackets after doing some walking! To be honest, I probably would've wanted to walk even if the buses were running - it's not a long walk, and the bus costs €1.80 per person (one-way) - not a lot, but not worth it for the distance, if you ask me. 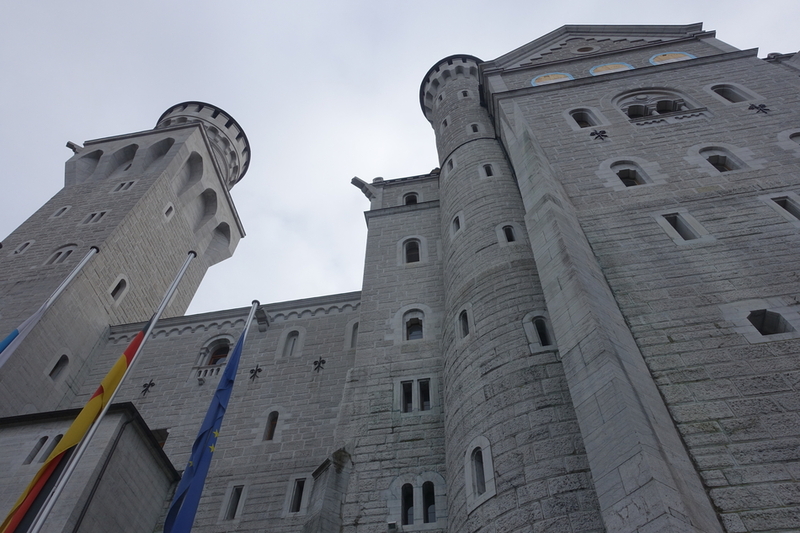 Since we weren't going to be going in the castle, after we got to the base of the behemoth, took a few photos, and got a really good look, we started trying to figure out how to get to the spot where all the great photos of Neuschwanstein are taken from. Unfortunately, we soon found out that the pathway leading around the back of the castle and up the hill to Marienbrücke (Mary's Bridge, and the photo spot in question) was closed - also due to 'weather.' A guard was posted at the gate, telling people asking about it that the bridge was unsafe and icy. We were really disappointed not because of the closure in and of itself, but because it just didn't seem to make sense...it was so nice out that people were just wearing sweaters sans jackets! D - As Shannon said above, basically the whole reason we had decided to visit Neuschwanstein was to see the beautiful, sweeping views of the castle and surrounding landscape that are available from Marienbrücke. Because of the way the castle is situated on a hilltop, you really can't appreciate it in all its grandeur unless you observe it from a few hundred feet or so away. And you can't really do that unless you have access to Marienbrücke, or can fly so, yeah, I was super disappointed when I heard that it was closed. However, I did hear one guy ask the guard about people he had spotted on the bridge...was it possible to get up to Marienbrücke after all? If so, how could one do it with this guard, standing in front of a locked chain link fence, blocking the way? The thought left my head soon after it entered and both disappointed, Shannon and I started back down the hill. It looked like we were not going to get to view the castle from the inside or even really the outside! 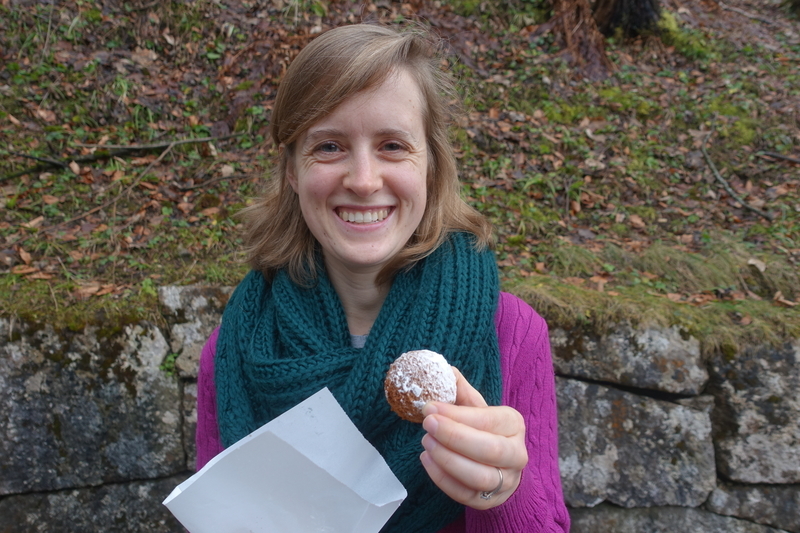 As we started to walk back down the hill towards Hohenschwangau, we noticed people stopped along the path with paper cones full of donuts. We figured they must be Neuschwanstein specialties, so needed little convincing to share a few of the deep-fried doughballs (later research tells me they're called quarkballchen, which basically translates to "little Quark cheese balls." Turns out they're a German treat and not necessarily unique to Neuschwanstein but personal experience tells me they're really tasty regardless). D - Considering my susceptibility to the siren call of fried foods when I'm even remotely somewhat depressed (or, let's be honest, all the time) the doughnuts were a no-brainer to me. I was just glad that Shannon was on the same page. Crispy, soft, warm, and capped with a fresh dusting of powdered sugar - had the events that were soon to take place not have happened, then those delicious little balls of goodness would have probably gone down as the highlight for the day. D - Looking back now, I would be very surprised if the staff at Neuschwanstein didn't know that so many visitors step over the unguarded gate and take the alternate path to Marienbrücke. They'd have to be totally ignorant not to. I mean, it happens with such regularity that there are people ducking under the gate in this picture I found on Google Maps. I suspect that security turns a blind eye to the activity (when it's not truly unsafe) because they know people have traveled from around the world to see the castle and, for the sake of good business, they want people to have a good experience there. Why else would they not put a guard at both gates? Whatever the case, I'm very happy that we got the chance to see the castle as it's meant to be seen, even if we did have to go around a couple barriers along the way.